As far as we can tell the Society was formed in 1860 under the direction of Daniel Gurteen, the pre-eminent businessman in Haverhill and we are delighted that his family has maintained close links with the society up to the present time with Mr. Christopher Gurteen being our President. Unfortunately, no records has been found of the Society’s earliest efforts, but it is known that Barnett’s ‘The Ancient Mariner’ was performed in the original Old Independent Church in Haverhill in 1871, the conductor now being Daniel Gurteen jnr. Handel’s ‘Messiah’ was given in 1874 with the same composer’s ‘Samson’ and ‘Judas Maccabeus’ in succeeding years. Such was the popularity of the Society special trains from Halstead, on the Colne Valley Line, were organised for its audiences! In 1897 Handel’s ‘Acis and Galatea’ proved financially disappointing, the group began to falter and was disbanded in 1905, after a half-hearted ‘Messiah’. After a lapse of almost twenty years the Society was revived in 1924 with a fine performance of ‘Elijah’ one year later. ‘The Ancient Mariner’ was revived for 1926 and there were intermittent performances for the next two decades, including Sterndale Bennett’s ‘The Woman of Samaria’ in June 1942 (this was conducted from the organ by Mr George Leake who had been with the Society since 1889)! In 1950 two combined concerts were given with the Clare Choral Society, one, in March, of ‘Hiawatha’s Wedding Feast’ with Acis and Galatea, and secondly ‘Messiah’ in December. It appears that the Society then lapsed again until October 1964, when Sir David Willcocks became President for several years and gave valuable support to the Society offering the services of several students who subsequently achieved national and international recognition. These included Stephen Varcoe, Nigel Perrin, Charles Brett, Sir Andrew Davis and John Wells. During the 1960s and 1970s the Society continued to perform a wide range of oratorios, cantatas and songs in Haverhill and the surrounding villages under a number of conductors, but the appointment of Edward Dodge, Head of Music at the Friends’ School, Saffron Walden in 1987 heralded a new era for the society and with increasing numbers of singers bigger and more demanding works were presented such as ‘The Music Makers’ (Elgar), ‘Carmina Burana’ (Orff), ‘Sea Drift (Delius), ‘Ein Deutsches Requiem’ (Brahms) and the Verdi ‘Requiem’. The Society’s repertoire increased in other areas to include songs, operatic choruses and Christmas music. Under Edward’s baton the Society made a very successful visit to Haverhill’s French Twin town, Pont St Esprit, in 1990 when two concerts were given with choirs from both towns singing together. Edward ‘retired’ in 2002 after fifteen years at the helm and was succeeded by Jane Wright, then Head of Music at Samuel Ward Academy in Haverhill. Under her direction the repertoire was expanded further and yet more ambitious works undertaken such as ‘Chichester Psalms’ (Bernstein), and part of ‘Vespers’ (Rachmaninov), but also, in a lighter vein, music from Gilbert & Sullivan, Rogers & Hammerstein, Andrew Lloyd Webber and Burt Bacharach. It society now ‘boasts’ that it has recently sung music in English, French, German, Latin, Italian, Russian, Japanese and Hebrew! A second successful visit to Pont St Esprit took place in 2016 and their choir are returning to Haverhill for the second time to sing with us in October 2017. The future? Jane, in turn, ‘retired’ in 2018 and we are now delighted to have John Clenaghan, who has long experience in choral music, as our Musical Director. (For more biographical information about John, go to the ‘Who are we’ tab). 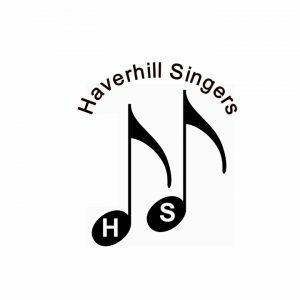 With almost 50 members Haverhill Singers is enjoying one of its most successful periods ever. Upcoming activities are shown in the Future Events tab.